Modern homes are much more than places to shelter and rest. They’ve become a place to be entertained and to entertain other people such as family members and friends. When it comes to entertainment features in a modern home, the only limitation is your imagination. The latest technologies and home entertainment-related products give home owners a wide range of options which were not available for previous generations. These are some popular ways to make your home a more entertaining place to spend your time in. If you have the space in your home, converting one of your rooms is the ideal way to create an area dedicated to all types of entertainment. These rooms can be filled with a wide range of traditional game room equipment such as pool tables, dart boards and much more. More modern gaming products could also be added for the gamers in your home such as gaming systems, consoles and gaming chairs. Finally, this room could also be used as an alternative room to watch TV, listen to music and relax. The internet is playing a bigger role in all of our lives including the way we spend our free time. Installing a fast internet solution such as AT&T U-verse in San Francisco gives a home owner many more options when it comes to the entertainment they have access to. You can choose bundle options that let you view hundreds of HD TV channels, play games, use the internet more effectively and much more. This is an entertainment feature for the adults in your home. If you entertain friends and family on a regular basis, a bar is a feature which makes it much easier to host these get-togethers. Having a specific area to relax and drink your favorite beverages is a much more organized way to host guests rather than using different areas of your home. Home owners are not restricted to entertaining indoors. Patios and gardens are the perfect places to relax and entertain others, especially during warmer months of the year. However, these outdoor areas need to have certain features which make them more welcoming and comfortable for you, your family and your guests. Adding features like outdoor furniture, outdoor heating systems, barbeque grills and outdoor bars are just some of the ways you can transform the outside of your home. If you have the space outside and the budget, a pool adds even more to the outside area of a home. Most people live busy lives, trying to balance work and family life. There are times when you simply want to take your mind off things at home. Having a home that includes a wide range of entertainment features is the perfect way to do this without having to leave your home. 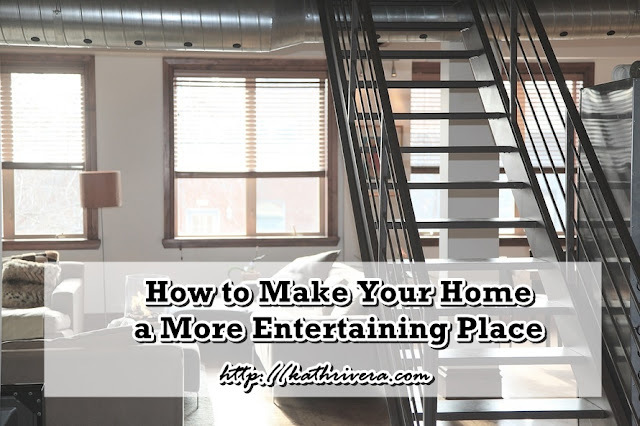 Adding the entertainment features mentioned above also makes your home a much better place to entertain other people including young and old individuals.